The North Downs Way is going to be my main walk of 2008 and I did this, the first stage of the walk, on Sunday 30th March. I drove down from Walthamstow and parked at Farnham Station which is just a couple of hundred yards away from the start of the North Downs Way. I had almost not done this walk because I had woken up to heavy rain and the weather forecast was poor for the rest of the day as well, however I don't think I have encountered a forecast that has turned out to be more wrong. The rain soon passed over, and the day ended up being bright and sunny and also very still which helped the weather seem much warmer than recently which made for very pleasant walking conditions. 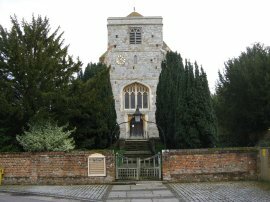 The actual start of the route is beside the rather busy dual carriageway of the A31 Farnham Bypass in Farnham. 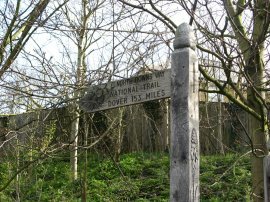 Here there is a small notice board describing the route along with a fingerpost which reads"153 miles to Dover", photo 1. 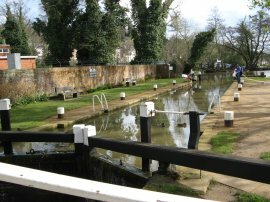 The route follows the road for a short distance before taking a lane, photo 2, that runs off to the right. 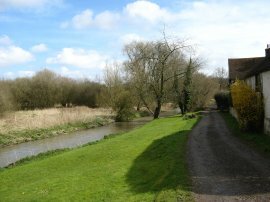 After passing a number of houses this runs down to continue alongside the banks of the River Wey (North), photo 3. Reaching a house besides the river the route follows the track round under a railway bridge and along the edge of what must have once been the floodplain of the river. 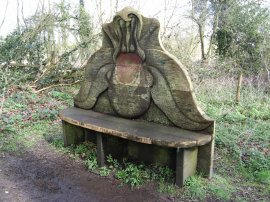 The path turns right by a seat carved into the shape of an orchid, which also quotes the 153 miles to Dover, and heads along to join a road where the route turns left. The air was filled with the sound of birdsong as I made my way between the trees. Although the weather was dry it clearly had been very rainy quite recently and the path in this area had been quite slippery and muddy in places. Reaching Moor Park Lane the route once again turns left heading gently down along the road to cross a bridge over the River Wey, photo 5. 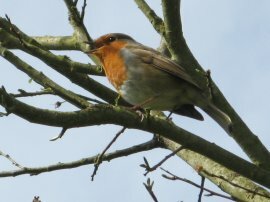 There were lots of little birds flying amongst the trees and hedgerows including the Robin in photo 6 which was singing from the top of a small tree. 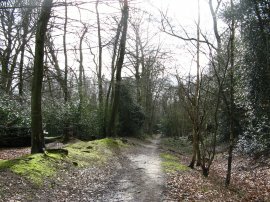 At this point the Greensand Way, which the route of the North Downs Way had been following from Farnham heads off to the right into the grounds of Moor Park and the North Downs Way continues ahead into Compton Way and up a short steep stretch of road. Towards the top of the hill the route takes a footpath that runs off to the left. 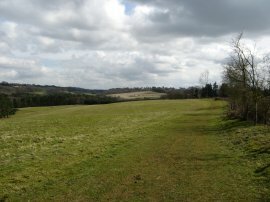 The route heads alongside fields and into the Runfold Nature Reserve, one of several nature reserves the route passes through on this stage to Guildford. At this point the path, although in very pleasant countryside, was rather smelly due to methane coming from an old landfill site beside the woodland. Reaching a sunken lane, photo 7, the route turns right for a short distance and then left, to head down to a road. 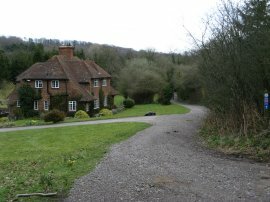 The route heads diagonally across this road and takes another short stretch of footpath down to another road where the route turns right, passing a number of very fine houses on the way. Reaching Farnham Golf Club the route turns left down Binton Lane. 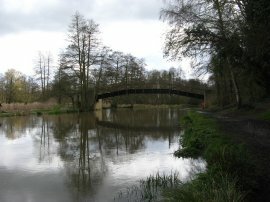 Eventually the route leaves the road over a very small wooden footbridge and follows a footpath that runs along side the fairways of the golf club. 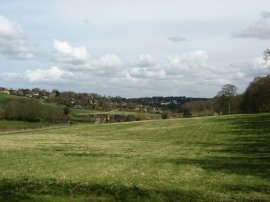 After a while the route leaves the houses and golf course behind and takes a straight path that runs along between fields to reach a road just above the village of Seale. According to some markers part of the fields had recently been planted with Parsley although there was nothing to see yet. Growing besides the fields, and in a number of other places too was the plant in photo 9, although I have been unable to discover what it is, any clues? 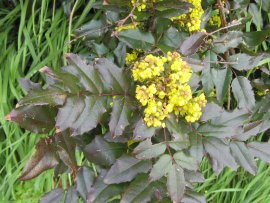 The plant has now been correctly identified as the Oregon Grape. 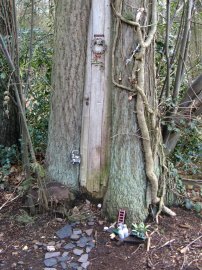 Crossing the road the route continues ahead, passing a tree in Payn's Fir Wood that has been very inventively decorated as a little house, photo 10. The route turns left to leave the woodland, skirting the gorunds of a very imposing house, before turning left to run along the edge of a field overlooking a broad valley, photo 11. For a while the route runs parallel with the A31 Hogs Back Road and I could hear, and occasionally see, the cars running along the top of the ridge on the other side of the valley. Crossing the end of a lane the route heads quite steeply uphill along a public byway, photo 12, though fortunately no vehicles passed me while I was walking along this stretch of the route which was quite narrow in places. Passing Little Common the route joins a small road which runs down into the charming village of Puttenham. Here I spotted the first of several groups of children carrying large rucksacks and clad in bright green flourescent jackets, some of which can just be made out behind the car in photo 13. 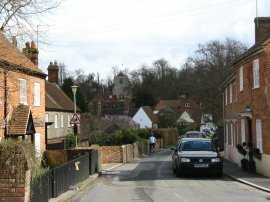 The route heads through the village, passing the church of St John the Baptist, photo 14, and on leaving Puttenham turns right along the B3000. 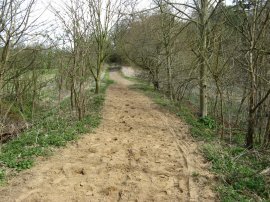 A short distance further on the route turns to the left up a broad track, opposite a Harverster Pub. 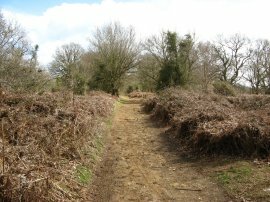 The track runs alongside another golf club on Puttenham Heath before entering a slightly more wooded area by Monkgrove Copse, photo 15, where I stopped and had my lunch. 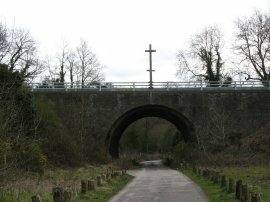 The route continues on to take a driveway that runs under the A3 and then almost immediately passes under the B3000, the bridge carrying the road above bearing two wooden crosses, photo 16, a reminder of the routes association with the Pilgrims Way. 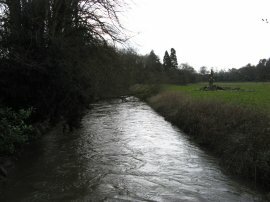 The Pilgrims Way originally ran between Winchester and Canterbury and there are many stretches where the old trackway and the North Downs Way converge, especially along sections where the 'Pilgrims Way' has not been incorporated into a metalled lane. 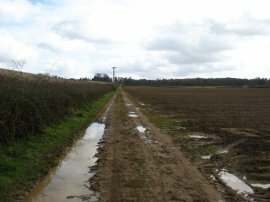 Crossing Down Lane, the route then heads along a very sandy lane, photo 17, towards the aptly named Sandy Farm. Passing the farm the route enters into the edge of West Warren wood, climbing gently uphill into the Losely Estate nature reserve. Reaching East Warren the route turns briefly to the left to join another very sandy track that runs alongside the edge of the trees. Leaving the woodland the route joins a paved farm track turning left and then following the road round to the right down to Piccard's farm. 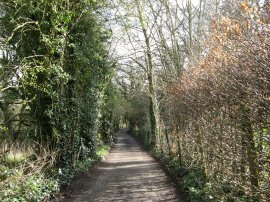 Having passed the farm, the route joins an unsurfaced track and starts heading down towards the suburban fringe of Guildford, photo 18. The track leads into a road which runs down to a T junction by the Ye Olde Ship inn. Here the road turns right and then left down Ferry Lane. This crosses over some railway lines and then drops steeply down to reach the River Wey, photo 19, where I finished my walk along the North Downs Way for the day. At this point I turmed to the left and made my way along the river bank into the centre of Guildford to catch the train back to Farnham. Reaching the banks of the River Wey I had, according to my GPS, walked 9.0 miles although I think the actual distance was a little further than this. 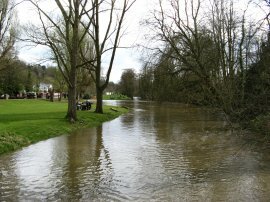 The river level was very high from the recent rain, almost over its banks in some places as I followed the river round to Millmead lock, photo 20, which marks the start of the River Wey Godalming Navigation. Despite the wet start to the day and the very negative weather forecast it was a lovely day when I arrived in Guildford and the parkland besides the river, photo 21, was packed with people enjoying the warm sunshine and I to joined them, sitting for a while on a bench in the sun before heading on to the station. Reaching Guildford Station I had walked 9.97 miles and I was pleased to have the first stage of the walk completed. Three years ago I walked the what for me will be the next two stages of the North Downs Way between Guildford and Dorking and then Dorking to Merthsam and hopefully I will be able to get back to redo them before too long.